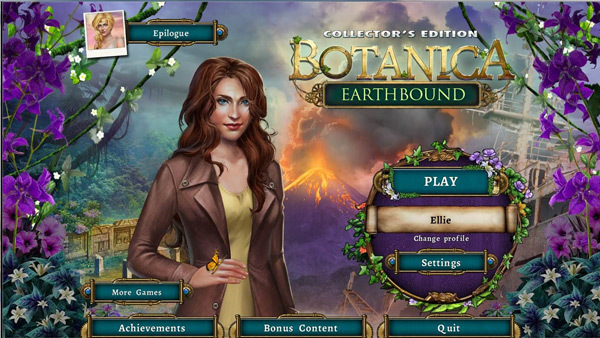 Botanica: Earthbound follows Ellie Wright and Ian Garrett through the land of Botanica on a quest to find their loved ones before the ominous volcano destroys the land. 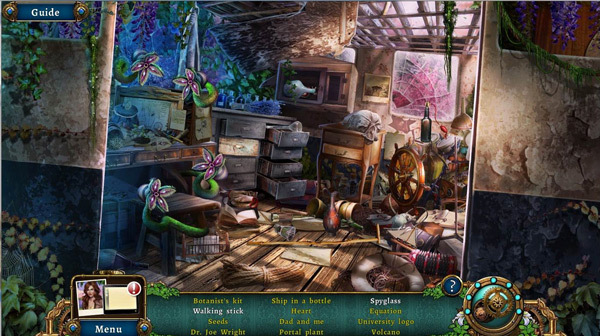 Explore the exotic land of Botanica as they attempt to find a way back to Earth in this stunning hidden object adventure game! 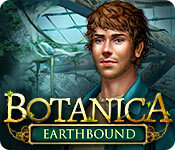 Botanica: Earthbound is a unique and challenging hidden object game following the continued adventures of Ellie Wright and Ian Garrett. Ellie is on a mission to uncover what happened to her father who mysteriously disappeared more than 20 years ago. Ian is desperately trying to return to Earth and reunite with his daughter. I connected with the characters in the story for different reasons, and I was thrilled to find a protagonist who shares my daughter’s name. I have yet to play the earlier edition of this series, but that didn’t prevent me from picking up on the storyline. However, after enjoying Botanica as much as I did, I am looking forward to exploring the previous game as well. I was really impressed by Botanica: Earthbound for a number of reasons – the graphics are superb, the storyline is intriguing, and the gameplay itself was challenging and interesting. Although the game contained all the typical features of a Collector’s Edition – achievements, bonus chapter and content, strategy guide and helpful extras – that was the only thing typical about this game. 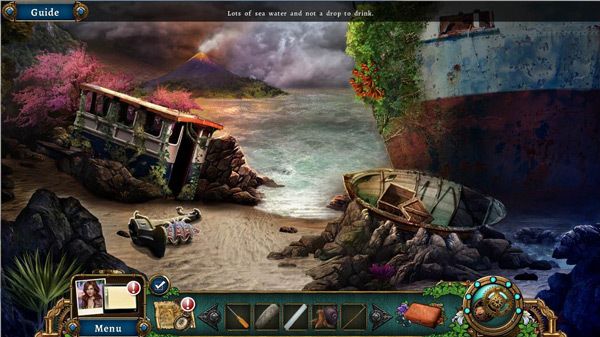 Around every corner was a new adventure and even the hidden object scenes had a fun new twist on them. I truly enjoyed every minute I played and loved the new level of challenge! The graphics in Botanica: Earthbound are clear and well-done, evoking the true feel of the setting. The animation was a little retro, with overly dramatic voiceovers to compensate for the lack of movement in the cut scene but not distracting from the story. The music was tolerable and supported the story without becoming annoying too quickly, which I appreciated because this game was more time consuming than any other I’ve played. The gameplay is logical but not easy, even on the most casual setting. I found myself checking the strategy guide more than once to get past a stumbling point. The guide keeps up with your progress so each time I opened it to check for a next step, it automatically showed me where I was, which saved a lot of time digging through chapters. The interactive map was also useful in traveling between scenes and identifying which areas had activity to be completed. The hidden object scenes throughout Botanica: Earthbound are by far the best I’ve ever encountered. None of them are a straightforward seek and find objects from a list. Nearly every object requires some interaction to uncover and many trigger a mini-game or puzzle you must complete to pick up the object. Some HOS contain silhouettes of objects to be found and even those require you to find multiple pieces and assemble the object before you can pick it up. 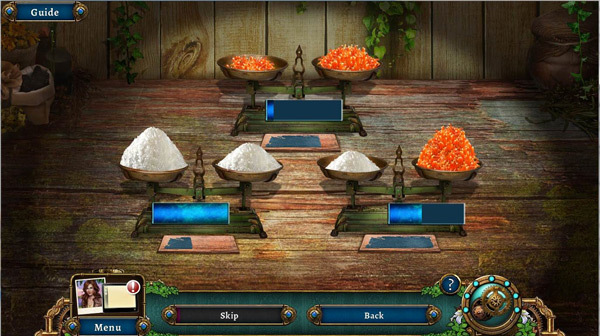 I was delighted to find something out of the ordinary and truly challenging in hidden object scenes! In addition to the unique and challenging HOS, Botanica: Earthbound is also full of mini-games and puzzles to be completed. I usually end up enjoying the games more than the HOS, but, this time, I found the games almost too challenging. Several took me too long to solve, and I ended up going with the skip button just to get on with the game. While I enjoyed the concept of most of the games, after spending as much time as I did completing the HOS, and all the games and puzzles hidden within, I had little patience left for the more challenging puzzles that didn’t solve quickly. If you’re up for a challenge, and maybe snowed in with some extra time on your hands over the holidays, I recommend giving Botanica: Earthbound a try. I enjoyed the thought-provoking, unique HOS, and I look forward to experiencing other game in this series.